Washington Capitals Sloppy Defensive Zone is the Biggest Reason Behind Recent Losing Streak - The Point Data-driven hockey storytelling that gets right to the point. If there’s one team that was in desperate need of a nice vacation, it was the Washington Capitals. Losers of their last 7 games, the Caps needed to take a breather and reassess their game. Their captain, Alex Ovechkin, will miss their next game, serving a one-game suspension for skipping the All-Star game. 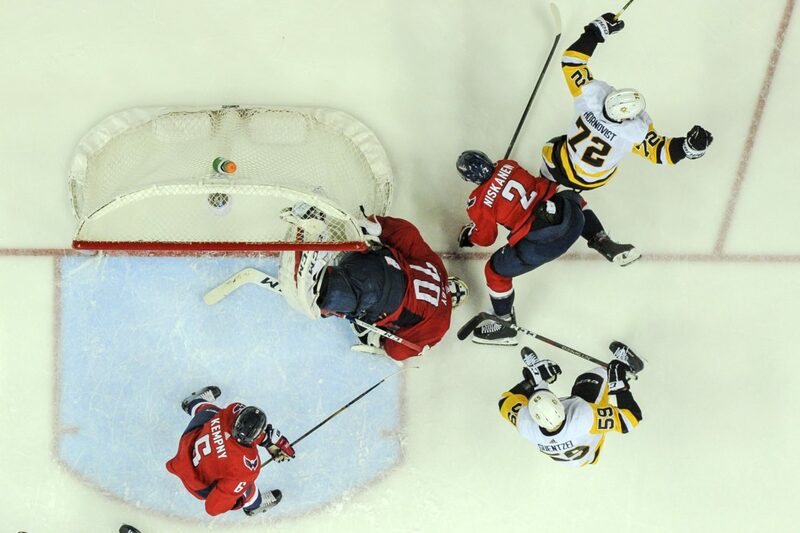 However, Washington doesn’t have any issue scoring goals. In fact, they’re tied for 6th in the league this year in goals for and have used their goal-scoring prowess to cover up their defensive issues. The defending Stanley Cup champs have allowed 161 goals against this year, 11th most in the league. The Caps have been consistently bad this season in their own zone where they’ve allowed 32.3 shots against per game. That’s the 11th most of any team. Allowing a lot of shots won’t sink your team but Washington isn’t just giving up perimeter shots. They give up a high amount of quality opportunities. This isn’t anything new for them. Last year, for much of the season, the Caps operated the exact same way, opting for a high-octane offense out-weighing a lackluster defensive effort. Their offense hasn’t dried up so what’s happened to their defense during their seven-game losing streak? At first glance, it would seem like they’ve just received bad goaltending with both Braden Holtby and Pheonix Copley’s even-strength save percentages dropping from .930 and .927 respectively, to .856 and .871. However, after watching their goals against over this losing streak, it appears team defense is more of an issue than goaltending. On this goal, Ryan O’Reilly beats two guys in a corner to send it up to the point where Vince Dunn just throws a backhand over to David Perron who’s wide open in front of their net. All five Washington players get caught puck watching including Jakub Vrana who lets Perron sneak in behind him. It’s hard to blame Copley on this when he gets hung out to dry by his team. The dreaded 3 on 0. Logan Couture pokes the puck away from John Carlson to take off on a breakaway as Brent Burns hops out of the penalty box and Tomas Hertl joins up with the two of them for a rarely seen 3 on 0. Couture opts to keep it and make a slick back-hand five-hole move to beat Holtby. Another goal where the goalie has absolutely no chance and a goal that really highlights a big problem area for them. Odd-man rushes. The Caps at even-strength had been averaging 4.4 odd-man rushes against per game before their losing streak which is almost exactly the same as their 4.3 average last year. Over their last seven games, they’ve averaged 6.1. That’s the most any teams allowed over that time. Odd-man rushes are some of the most dangerous opportunities you can allow. For the Caps to get back on track after their break they need to clean up their sloppy play. No more falling asleep in the defensive zone and better decisions with the puck. Smarter decisions will lead to less odd-man rushes and will help them control the puck more which would just lead to more offensive opportunities for them. 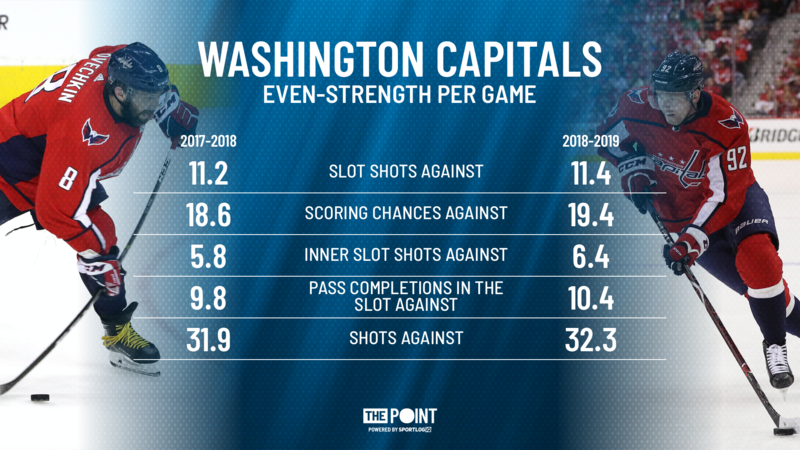 Washington has a very realistic opportunity to repeat as Stanley Cup champions but not if they continue to give up chances the way they have over their losing streak.